During 2018's hurricane season, more than a million Americans were evacuated from their homes during Hurricane Florence, while millions more were affected. To help you understand some of the terms used by meteorologists, we’ve compiled this alphabetical list of tropical storm terminology. ACE is an acronym for Accumulated Cyclone Energy. This is a measure used to express the combined duration and strength of tropical cyclones. It is also a good metric for scientists to compare storms and seasons to each other, as well as across different seasons. The ACE of a season is the sum of the ACE for each storm — taking into account the number, strength, and duration of all the tropical storms in that season. 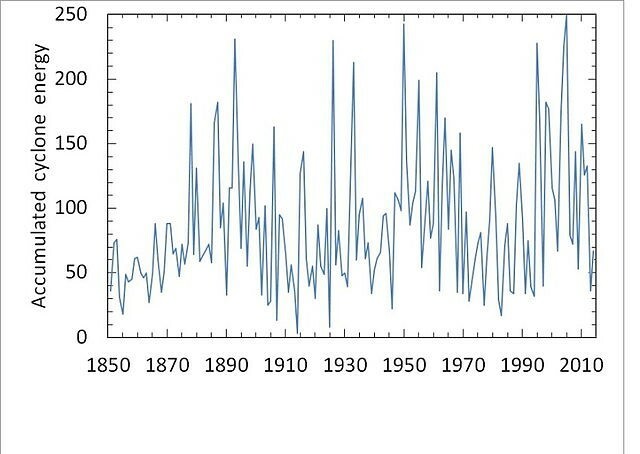 Atlantic basin cyclone intensity by Accumulated Cyclone Energy, 1850-2014. The cone of uncertainty, also referred to as the error cone, is a cone-shaped graphical representation of forecast error added to tropical storm forecast track maps. The cone extends on either side of the forecast track, from the 0-hour forecast point through the entirety of the forecast period. The cone is typically narrow at the beginning of the forecast period to reflect low forecast error, but becomes wider as the forecast extends into the future with progressively more forecast error. The cone is not based on the meteorology for a given storm, but on forecast error rates of storms from the previous five years. It’s a common misunderstanding that the effects of a tropical storm (storm surge, rainfall, wind) are confined to the area within the confines of the cone. This is false as the effects can reach hundreds of miles outside the cone. As forecast accuracy continues to increase, the size of the cone will decrease. Convection is the movement of moisture and heat from the lower layers of the atmosphere to upper layers through updrafts of air. Rising air cools and condenses, forming clouds. If there is enough moisture, rain will result. This movement sometimes occurs as a thunderstorm inside a hurricane. A cyclone is a broad rotating storm system with a central low pressure center. The lower the central pressure, the stronger the winds and more powerful the storm. The spinning pressure draws winds inward and upward, helping to form and intensify thunderstorms. Cyclones rotate cyclonically (counter-clockwise) in the Northern Hemisphere and anti-cyclonically (clockwise) in the Southern Hemisphere, though due to atmospheric conditions, cyclones are very rare in the Southern Hemisphere. Cyclones have different names in different ocean basins: In the Atlantic and eastern Pacific, they are called hurricanes; in the western Pacific, they are typhoons and in the Indian Ocean and South Pacific they are tropical cyclones. Data acquisition is a critical element of tropical storm forecasting. Aerial reconnaissance missions are flown by aircraft to gather data at regular intervals during the life of a particular storm. In the U.S., these missions are carried out by the Air Force and the National Oceanographic and Atmospheric Administration (NOAA). These specialized aircraft can examine the storm from above, fly through the storm or drop instrument packages into the storm to acquire data such as wind speed and direction, temperature, humidity and pressure at various levels of the atmosphere. Due to the limited range of manned aircraft, unmanned aerial vehicles (UAVs) with extended range and time aloft capabilities are used to monitor distant ocean regions. Data acquisition can and is also accomplished with helicopters, ships, weather buoys, low-level and single-use UAVs, radar, satellite and unmanned watercraft. Feeder bands are lines of thunderstorms and moisture-laden streams of clouds that are pulled into the center of a cyclone and can often appear to spiral into the center as the cyclone rotates. Very heavy rainfall can be associated with these bands of clouds and they can extend from the center of the cyclone for hundreds of miles. On a smaller scale, feeder bands are the lines of low-level clouds that are drawn into the updraft of a growing thunderstorm. A hurricane is a tropical cyclone in the Atlantic basin with maximum sustained winds of at least 74 miles per hour (119 kmh). Tropical cyclone formation occurs for a variety of reasons under a variety of conditions. Warm ocean water is critical to formation as it creates an unstable environment that allows moist air to rise. Generally, water temperatures of about 80°F/26ºC are warm enough, but cyclone formation can happen in cooler waters. Also needed is an atmosphere that allows this warm air to cool as it rises. The release of heat further destabilizes the environment and allows the formation of clouds, rain showers and thunderstorms. Additionally, a stable environment is needed in the mid- and upper-levels to allow the thunderstorms to vertically grow without being blown apart by winds. Finally, an area of disturbed weather of some sort, even just a wave of low pressure, must move into this environment to enable cyclone formation. 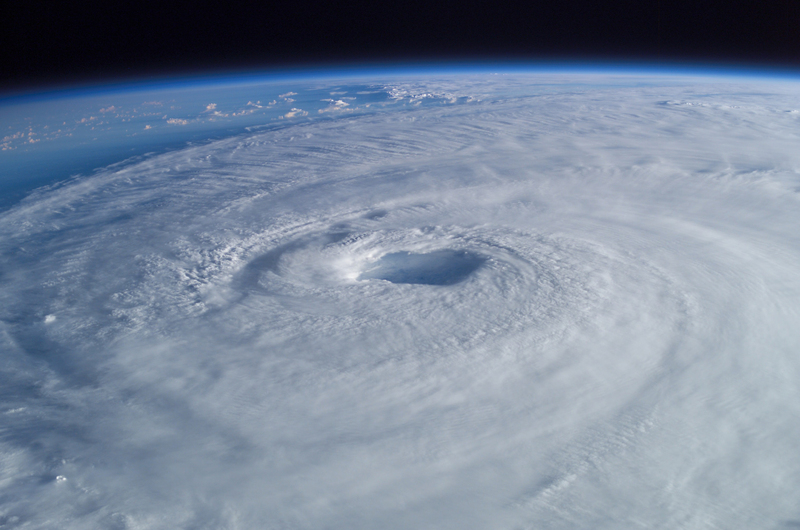 Hurricane season is the part of the year in which there is a relatively high incidence of hurricanes. The hurricane season in the Atlantic, Caribbean and Gulf of Mexico runs from June 1 to November 30. In the Eastern Pacific basin it runs from May 15 to November 30. Hurricane season in the Central Pacific basin runs from June 1 to November 30. Hurricanes can and do occur outside of these windows, however. 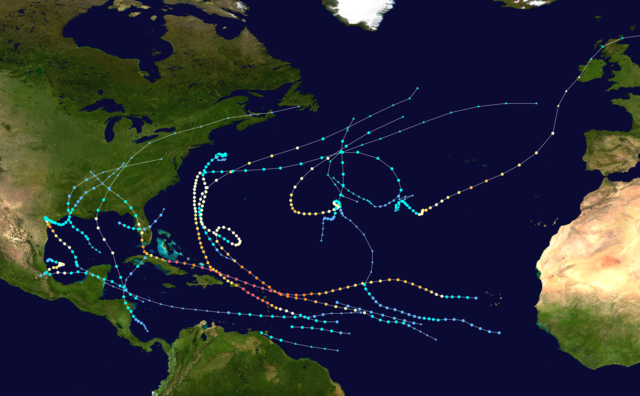 In fact, at least one tropical storm has formed in the Atlantic Basin every month this year. In the western Pacific, typhoon season is considered to be year-round. This map shows the tracks of all tropical cyclones in the 2017 Atlantic hurricane season. The points show the location of each storm at 6-hour intervals. The color represents the storm's maximum sustained wind speeds as classified in the Saffir-Simpson Hurricane Scale, and the shape of the data points represent the type of the storm. Landfall is when the eye of the hurricane or tropical storm crosses the shoreline and moves inland. It does not mean that the hurricane has “hit land” for the first time, however, as outer bands that carry flooding rain and severe winds typically arrive many hours or even days beforehand. Additionally, the initial stages of rising coastal waters, which can cause catastrophic damage, can occur days before the arrival of the eye. A single storm can have multiple landfalls. This occurs when a storm crosses a peninsula or changes direction, reemerging back over the water and making additional landfalls at a later time in other locations. Madden-Julian Oscillation (MJO) is one of many variables used by meteorologists to forecast tropical development. Small pockets of active weather moving west to east across the globe in equatorial regions is called the enhanced phase of the MJO. This is important in forecasting because it indicates an increased chance of tropical development: Since the MJO can be tracked and its movement anticipated, it can add an increased level of confidence to a tropical forecast. The MJO was discovered in 1971 by Roland Madden and Paul Julian of the American National Center for Atmospheric Research. The scale was developed in 1971 by civil engineer Herbert Saffir and meteorologist Robert Simpson. Important to note: The Saffir-Simpson Scale should not be used to estimate storm surge. Spiral bands are clouds and thunderstorms that spiral inward toward the center of a hurricane. See also: Feeder bands. 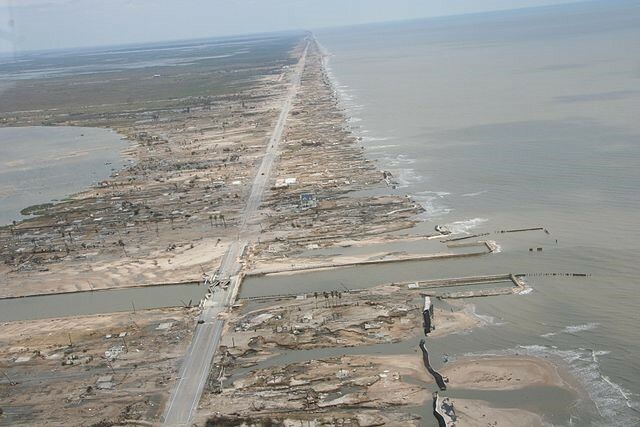 Total destruction of the Bolivar Peninsula (Texas) by Hurricane Ike's storm surge in 2008. A storm surge is a pronounced rise in sea level accompanying a hurricane or other severe storm. Sea water is pushed inland across coastal areas by a broad wind field circulating around the storm’s center. The severity of the storm surge, which can be many feet above normal tides, is influenced by the storm’s intensity, the size of its wind field, the shape of the coastline and the slope of the sea floor. Most injuries and deaths associated with tropical cyclones are related to storm surge. Note: Because each location that may experience storm surge is different, storm surge can be very difficult to forecast with precision. Therefore, it is critical to heed the directions for preparation and/or evacuation from local officials. The set-up tide is the initial rise in sea level prior to a landfalling hurricane or tropical storm. Unlike the storm surge, which typically arrives at landfall and can be quite dramatic, the set-up tide slowly builds up to two days before landfall. Set-up tides are particularly dangerous because they can cut-off low-lying evacuation routes well before the arrival of the storm. A tropical depression is a tropical cyclone with maximum sustained winds less than 39 mph. Tropical storms are one of the most destructive weather systems on Earth. A tropical storm is a system of thunderstorms characterized by surface circulation and accompanied by maximum sustained winds of 39-73 miles per hour. Cyclones, typhoons and hurricanes are all tropical storms, categorized according to where in the world they occur. A tropical wave is a cluster of thunderstorms in the tropics, moving westward within a low pressure trough, that has the potential to become a tropical depression if other favorable atmospheric conditions are present. 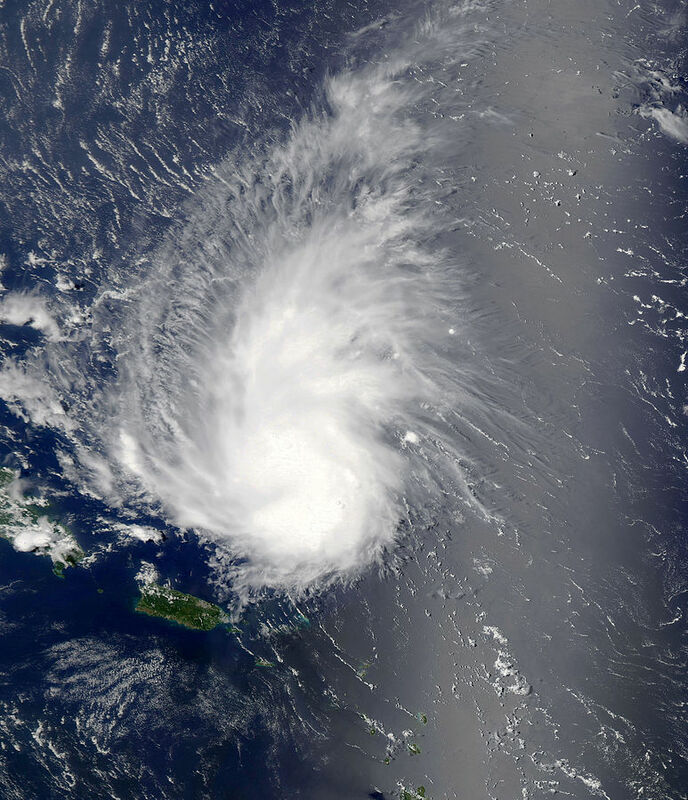 Tropical Wave Dorian on July 29, 2013, two days after losing tropical cyclone status. Typhoons are tropical storms that occur in the Northwestern Pacific basin and in the proximity of the Philippines, China and the Marshall islands.